Flight To Quality - What Does It Mean? 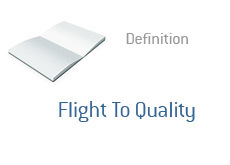 What does "flight to quality" mean? What is the definition of "flight to quality"? Back in the '20s and '30s, when our parents and grandparents started to worry about how safe their money was, they would usually do the same thing - withdraw their money from the bank and stick it under their mattress. This, in a nutshell, is the idea behind "flight to quality" - people moving their money from "higher risk" situations to lower risk situations. For many people, the underside of their mattress was the absolute safest place in the world that they could have stored their money. In this day and age, however, people tend to be a bit more sophisticated in terms of where they park their money. When people are uncertain about the future direction of the markets, they tend to focus on buying the good stuff. Blue chip companies. US treasury offerings. The AAA rated securities and debt offerings that will stand up in the face of a financial tsunami. Risky OTCBB stocks? Investments in unstable foreign countries? Speculative commodities investments? Forget it - when people are nervous, they usually want to buy quality. This can apply to anyone from individual investors to sovereign governments to pension funds. When people worry, they buy quality. Example - a multi-billion dollar hedge fund manager, startled by a sudden breakdown in the global economy due to a couple of major bank failures, decides to sell equities and options holdings for the short-term, electing instead to buy "quality" such as US Treasuries and blue chip stocks such as Exxon Mobil and Johnson & Johnson. This is a "flight to quality", and occurs pretty much every time investors get the jitters about the markets.